Credenz is the annual technical symposium organised by the PICT IEEE Student Branch. Started in 2004, with a view to elicit the best out of each and everyone, it has grown to become one of the finest technical events today. Credenz aims not only to infuse a competitive spirit among participants, but also widen their horizons in the ever-changing field of technology via myriad seminars and workshops. Participants get a chance to discover their talents, and thrive in numerous events like Clash, Bplan, Roboliga, WebWeaver, Pixelate, Cretronix, Paper Presentation and Mad Talks.This is a unique chance for the students to go beyond the traditional spheres of academics, and make the most of their potential. It was this spirit of learning and discovery that inspired the team to put the entire social experience of the event online in 2009, through the arduous time of the swine flu which made social gatherings impossible. Following this great legacy, the team took Credenz ’10 to a whole new level, and now the PICT IEEE Student Branch presents to you Credenz ’14, a podium for you to nurture and cultivate your talents. It is always said that knowledge is not something to be confined to oneself, but something to be shared as much as possible. One of the most popular events of Credenz, Paper Presentation gives a platform to undergraduate students to present papers on any technical topic. So, here is your chance to challenge your own skills to research and put forth your ideas on technology in front of an experienced panel of judges. A team of maximum three candidates pursuing undergraduate / postgraduate program are allowed. Rs. 200 per team for Non IEEE members and Rs. 160 for IEEE members. Football- The most breath-taking game becomes even more so when it’s the robots that play the game! Bring your footballer-bot to the game and become a part of the most attractive of the events of Credenz ’14. As an event that surely keeps everyone’s eyes transfixed on the field, RoboLIGA does not fail to entertain and teach at the same time. Explore the Robotics-aspect of Credenz and experience the extravagant thrill as you make your bot wade past the opponent and ...that’s right – SCORE! Rs 200 for NON IEEE member and Rs 160 for IEEE members. A maximum of 3 candidates pursuing undergraduate program in their institution are allowed per team. A C/C++ coding competition held in high regard for the conceptual challenges it brings to a coder’s mind, CLASH beckons all the programmers out there, amateur and experienced alike, to participate and enhance their coding skills! Utterly professional yet non-compromising on coding-fun, CLASH tests you for your speed, logic and checks if you have the right outlook towards a problem. So ‘compile’ yourself and join this national-level coding combat in Credenz ‘14! A maximum of 2 candidates pursuing undergraduate program at their institution are allowed per team. If you have got a crazy idea - A technology you think should exist, an invention that can be made but no-one has ever thought of , welcome aboard ! Participate and be a part of this astounding event called My Amazing Discovery, viz. M.A.D TALKS and give a presentation on what your idea is, why is it out-of-the-box and not easily possible to implement, but yet why you think it is sheer brilliance! A platform to prove technology starts with MAD people and their MAD ideas! Rs 150 for NON IEEE member and Rs 120 for IEEE members. A team of maximum 3 candidates pursuing undergraduates/postgraduates/junior college are allowed to participate. might just be lying somewhere at the back of your mind. Rs 50 for Non IEEE member and Rs 40 for IEEE members. A maximum of two candidates pursuing under graduate/graduate program at their institution will be allowed per team. Plug onto Network Treasure Hunt, an online treasure hunt where participants follow clues and visit different websites to solve riddles. Solve a series of strategic clues to complete the track and win prizes. Decrypt rules, follow the trail and race to the finish to win exciting goodies! This is your chance to challenge your technical skills. So go on, login and be Sherlock for a day ! Think about what happens when you visit a website that is poorly designed as opposed to one that is clean, easy-to-use and modern? The look and feel of a website is critical to keep visitors engaged online. If you think you can do this, it’s time for you to design such a site. A striking blend of technology, skill and CREATIVITY can help you win this competition. Develop a website captivating enough to grab the attention of your peers and an experienced panel of judges. A team of maximum 3 is permissible for the event. Plot the pixels of your imagination on the virtual canvas! If you think you can carve your message with the fusion of colours, designs, words culminating into an elegant art, here is your chance.Integrate your creativity with technology and paint your ideas! -Is your Business strategy foolproof? This event, also known as B-Plan, is an opportunity for all young minds with a spark, who aim to become entrepreneurs in the near future, to THINK big and prove it to the world.It will certainly be a good opportunity to have discussions with students, just as ambitious as you, and the well-learned people who can provide valuable guidance. Come, step forward and present your innovative ideas to a distinguished panel of judges. A maximum of three candidates per plan pursuing undergraduate/graduate program at their institution will be allowed per team. 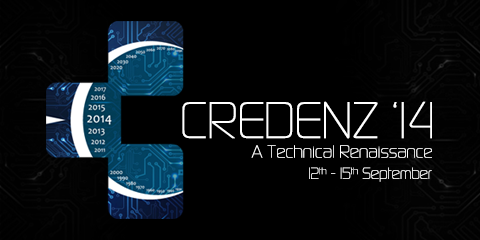 Credenz ’14 presents to you for the first time Cretronix- an electronics event. Start by answering questions about the basics, work your way upto debugging circuits and finally vie for the holy grail of electronics- circuit design! The team will consist of maximum of three members. Maximum of Three people in a team. A single person is allowed to participate, no teams will be entertained and may lead to disqualification. Play with “CREDENZ”, its logo or both and bring out the artist in you by creating your very own CROODLE (Credenz Doodle). A team of maximum two candidates pursuing undergraduate courses are allowed per team. - The workshop will be conducted by Institute of Embeded and Robotics Research, the training division of Campus Component. - Workshop will conclude with a show in which two humanoid robts will interact with each other. - Candidates should bring their own laptops. - Registeration can be done either individually or in a group of maximum four. - Registeration fee for a group is Rs.4400/- which includes a kit. - Registeration fee for an individual candidate is Rs.800/- in which a kit will be prvided only for the duration of the workshop. - All the candidates should bring valid I-cards. - Conducted by Infi-Zeal Technologies, this workshop aims at creating your own games,application,animations and storylines. - The development is based on MIT Media Lab's programming concepts i.e. SCRATCH. - The students can create their own games,play the game on their system and also control the game through Hand/Body Gestures on their systems via MICROSOFT Kinect. - There is no prerequisite for the workshop. - Laptop with working webcam is compulsory. - Registeration fee is Rs.1000/- per person. - All candidates should bring valid I-cards.